FEDERAL REPUBLIC OF NIGERIA: Nigeria has an area of 923,768.00 sq kilometres and lies between latitude 40 and 140 North of the equator and longitudes 30 and 140 East of the greenwich meridian. This is entirely within the tropical zone. It is bounded on the West by the Republic of Benin on the North by the Republic of Niger and on the East by the Federal Republic of Cameroun. On the North-East border is lake Chad while also extends into the Republic of Niger and Chad and touches the Northernmost part of the Republic of Cameroun. On the South, the Nigerian coast- line is bathed by the Atlantic Ocean. The major rivers are the Niger and Benue. The outlets of these rivers and their tributaries are masked by the walls of mangrove. Behind this barrier, calm lagoons extend from the western border of the great Niger. shows an almost unbroken carpet of green tree tops with small farmlands dotted here and there. In this belt, oil palm, which prior to the petronaira era was the main foreign exchange earners, abound. The soil in the Western part of the country is conducive to the growth of cocoa. North of the tropical forest is savannah with dense forests in the river valleys. This vegetation is largely grassland dotted with trees. The savannah zone provides excellent grazing lands for animal husbandry and the bulk of the country's meat comes from this region. A conspicuous feature of the northern part of the coun- try is the great Hateau which rises as a steep ecapement from the riverine plains of the Niger/Benue rivers to an average height of 606 metres with ranges of hills, between 1,515 and 1,818 metres in the Shore Hills around Jos. The Plateau descends gently northward in the direction of Lake Chad in the North-East and more sharply to Zaria in Kaduna State. 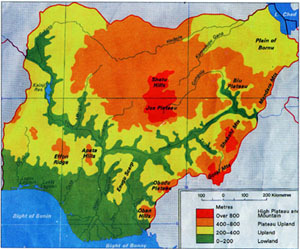 Although Nigeria is wholly within the tropics, its climate varies from the tropical at the coast to sub-tropical further inland. There are two marked seasons: The rainy season lasting from April to October and the dry season from November to March. Absolute maximum temperature in the coastal areas of the south is 37°c while the absolute minimum temperature is 10°. The climate is drier further north where extremes of temperature range from 45° to 06° are common. The Federal Republic of Nigeria is governed in accordance with the provisions of a Constitution.In 1914 the Protectorates of Southern and Northern Nigeria were amalgamated with the Colony (Lagos) by Lord Lugard to form what is now known as Nigeria. The music of Nigeria includes many kinds of Folk and popular music, some of which are known worldwide. Styles of folk music are related to the multitudes of ethnic groups in the country, each with their own techniques, instruments, and songs. Listen to music of Nigeria.